This species can be found from Alaska east to Labrador, Greenland, and Newfoundland. It can also south through New England, the northern portions of the Great Lakes States, and western Washington and Oregon. Found in cool temperate climates. It is found in coniferous swamps. 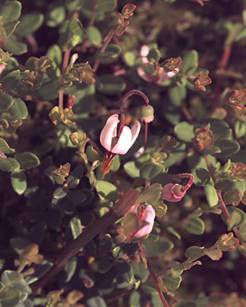 May be found in a bog garden, woodland, sunny edge, dappled shade, or as a ground cover. It thrives in moist coastal and boreal forests, and requires a moist or wet soil. The soil is usually very poorly drained. In the boggy areas the soil ph is very acidic, 2.9-4.7. Where as in the fen areas the soil ph is more alkaline, 6.0-7.5. It can be an early colonizer of secondary succession. Fire is a very important aspect. It is the first to colonize a burned bog area. The abundance increases with frequent fires. This species is shade intolerant, so mostly is related to having a coniferous overstory establish. Tsuga canadensis, Tsuga heterophylla, Thuja occidentalis, Thuja plicata, Chamaecyparis nootkatensis, Chamaecyparis thyoides, Populus tremuloides, Populus balsamifera, Betula pumila, Betula glandulosa, Betula papyrifera, Betula alleghaniensis, Fraxinus nigra, Chamaedaphne calyculata, Andromeda glaucophylla, Kalmia polifolia, Sarracenia purpurea, Ledum groenlandicum, Rubus chamaemorus, Rhododendron canadense, Rhamnus frangula, Drosera spp., Eriophorum virginatum, Eriophorum angustifolium, Carex spp., Cladina spp., and Cladonia spp. Seeds, cuttings, layering, or the division of suckers may be collected. Fruits ripen from August to October, and may persist through the winter. Cold stratification is necessary to break dormancy. The suggested period of cold stratification is 2-3 months. Then store seeds at 32 degrees F for 6-7 months, allowing germination to take place at 77 degrees F.
If seeds are sown, it is recommended to have a lime-free soil mix. Mature plants like highly acidic soil, pH 2.9 - 4.7. Seeds are the cheapest, but are very rare. Vegetative cuttings are common but are slow and difficult. Layering can take up to 18 months. Division of suckers is the easiest and best chance of success. If planted as a ground cover, it is recommended to plant 1 meter apart; it will form a thick carpet when they are thriving. The like very soggy, wet conditions, so water until established continuing to keep a boggy type soil. Very fast establisher. It regenerates quickly from sprouts of the rhizomes. 0.1 – 1 meter in full height. Data compiled by: Kevin Klein, 26 May 2003.